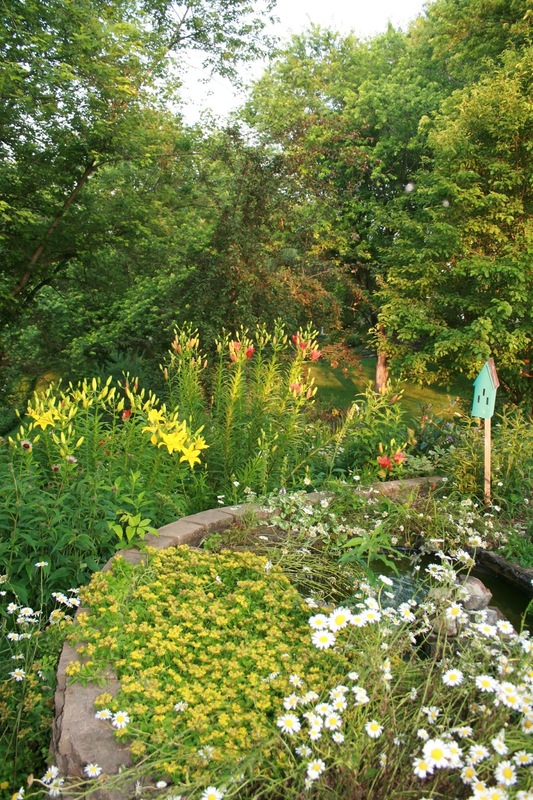 In early July, the pastels of the spring garden start to fade, and the hot colors begin to come to life. Gone are the pretty pinks and pale yellows, and hot pink, purple, red, and orange take over. And wow, do they make an impact! Because of their strong color, a few blooms can be seen from far away. I love the flower pictured below, but for whatever reason I can not remember the name of it for the life of me! It is a biennial, and reseeds quite well without being invasive. 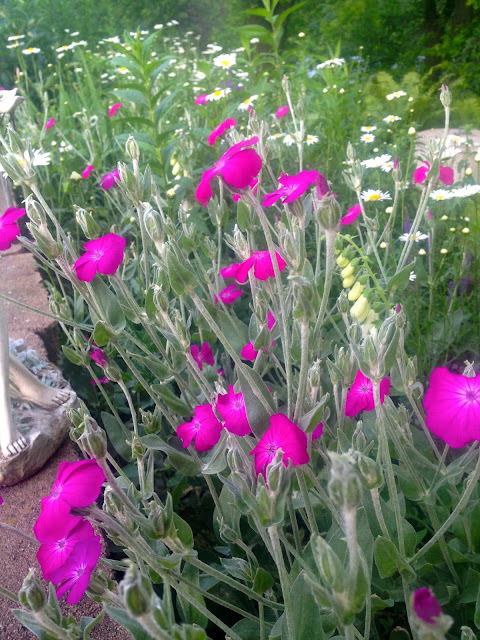 It has very pretty silver foliage that looks attractive even when not in bloom. It reminds me of Lamb's Ear, but with a much prettier flower. Because of it's silver foliage and bright blooms, it looks very lovely at night too. 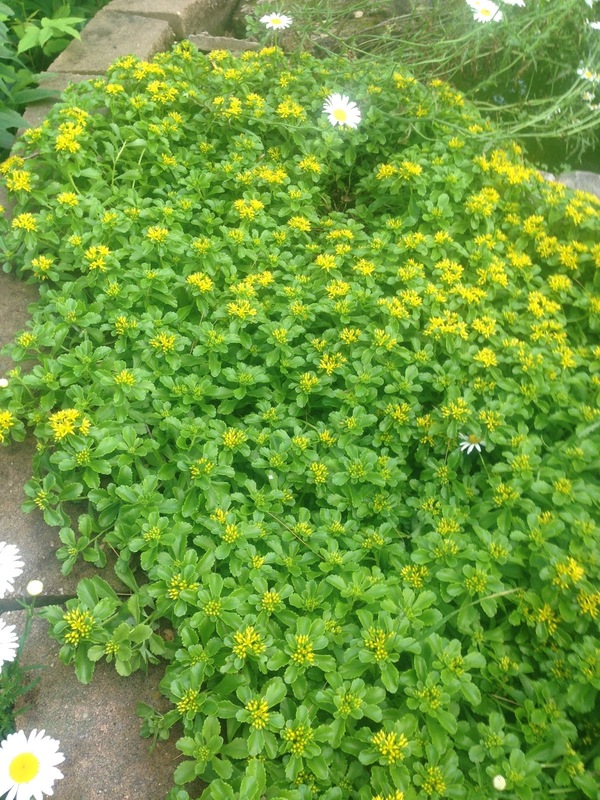 The ground cover sedum is also blooming. The leaves are a pretty chartreuse color with bright yellow blooms. The Stella de Oro Daylilies have just begun. 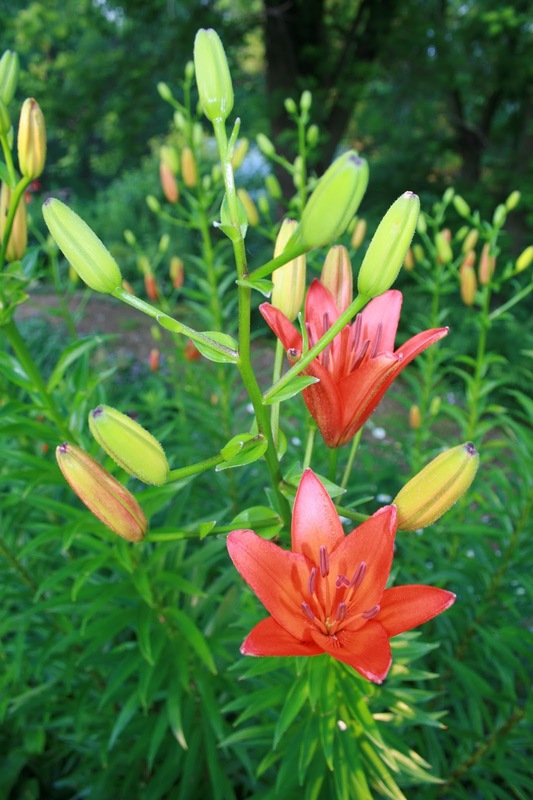 They are usually the first day lilies to bloom every year. 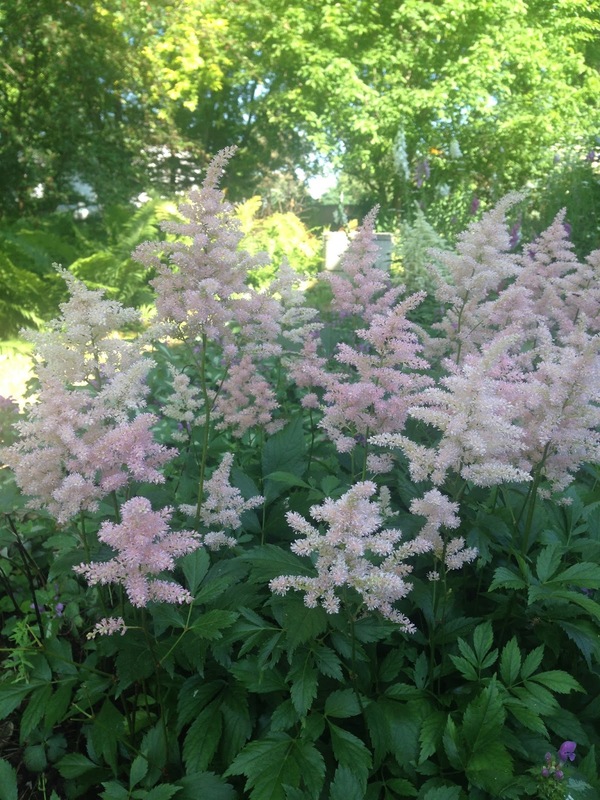 Last week I showed you a white Astilbe in bloom. This week the pink's are in bloom. I have both a pale pink and a hot pink. Below is pictured the pale pink. 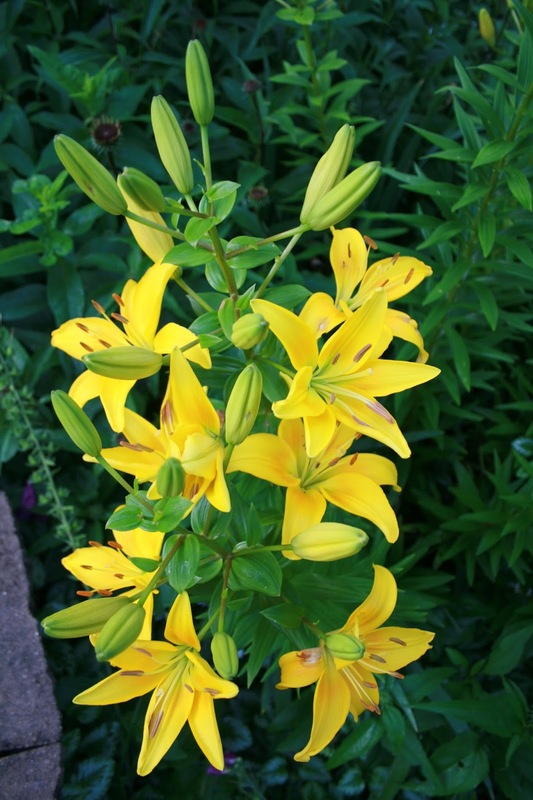 Asiatic Lilies are my favorite lilies because I love their tall stems…a must if you have a garden as large as mine. They will stand out for their height and their blooms. These orange lilies are over five feet tall. The yellow ones are a little smaller. This is the view from my front porch and/or kitchen window. The sedum is growing around the pond, and the lilies are in the second retaining wall beneath the pond. The white daisies are starting to fade a bit, but still provide enough contrast against the hot colors. 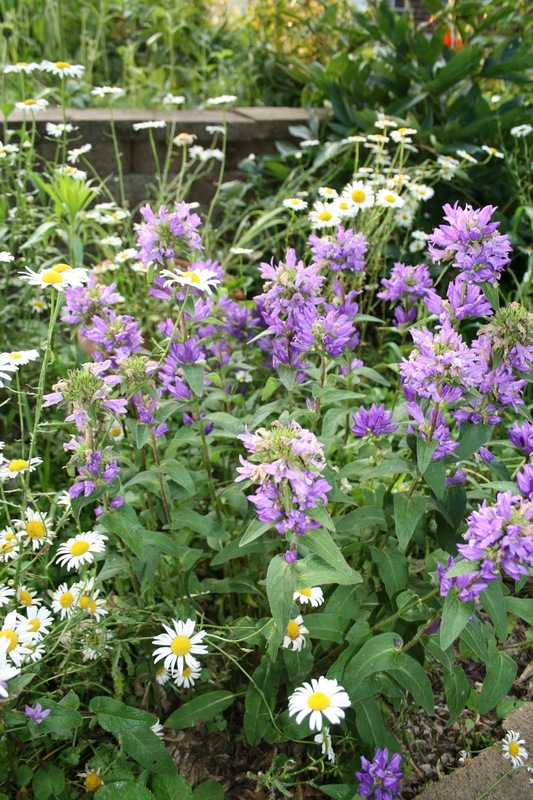 The blue flower is from the Campanula family. I have several plantings of Baby's Breath in my garden. They are so easy to grow, and provide excellent fillers for indoor arrangements. 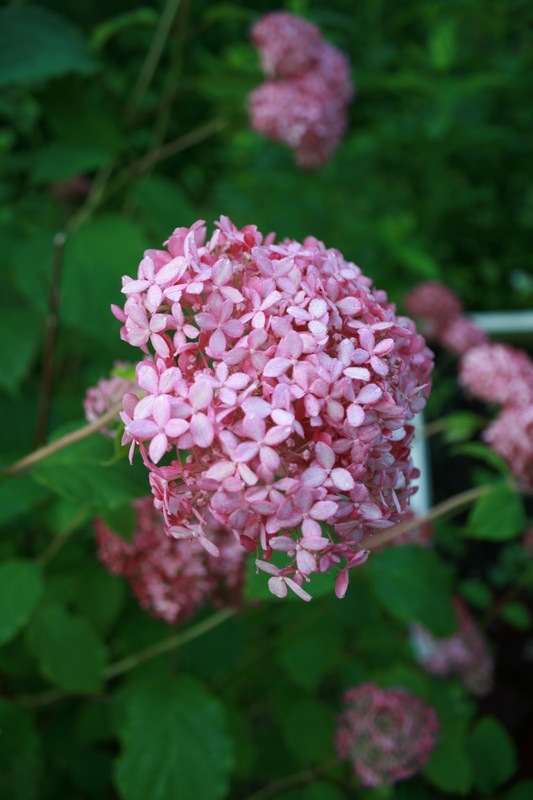 I have a rare and lovely pink hydrangea bush in front of my shed that the deer have been enjoying as well. Thankfully they left me a few blooms to photograph. My favorite part about Asiatic lilies is how perfect their blooms are: they look like they just came out of a florist's shop. You'd never know that this is such a hardy, easy plant to grow. The colors and blooms will only grow hotter and stronger from now through August! I can't wait till more come to life! Your garden is beautiful! I love all of the vibrant colors! You garden is gorgeous! I wish I had a green thumb. Oh my goodness, Amy! Your yard is amazing! Thanks for sharing it with us! Such a lovely garden! I love seeing all your photos and hearing the names of flowers. My parents owned a florist and my mom could always name every kind of flower and plant. Thank you for sharing yours! A so wonderful garden ! superb images ! Your flowers are beautiful, Amy! I'm so jealous that I don't have a green thumb, but I love all the color of your garden. Enjoy!